Today I'm really happy. Early morning CET time I watched Valentino Rossi clinched his sixth MotoGP world championship (eight including 250cc and 125cc) with victory in the Japanese Grand Prix at Motegi. 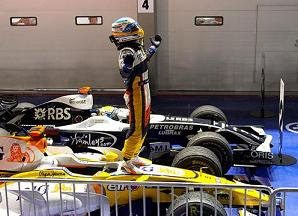 Then in the afternoon I watched Fernando Alonso scored a surprise success in one of the most eagerly anticipated Grand Prix in Formula One history, under the lights of Singapore. I know, there is the first Formula One night race in history happening in Singapore but I'm here in Prague, Czech Republic. But still I'm so happy with the achievement from both guys. This must be a good day for me. It's been amazing two weeks in Prague. I'm going out to walk now to enjoy the city. I've been following your posts for a while now and have found it to be inspirational. However, i have noticed that something seems to have fallen way for you to be doing what you are currently doing - traveling from country to country...spending countless hours studying and doing lectures...Here is an extract from your post in 2005 - i ask now - where is your family in all this? where is your wife and daughter? if you have given up your family for what you quote is the road less traveled - you are indeed a sad sad person and to be pitied if you think that all that you have achieved is much more important than your family. I'd choose my wife and my sons any day of the week over your would-be road less traveled. I'd rather be average and be a good dad than an excellent network engineer but a rubbish father or ex-father/husband. IMHO, we can't judge other people based on our own thinking. It would be like an eagle who's pitying a polar bear because it doesn't fly. While in fact, a polar bear has great life on its own without flying...just by being a polar bear. Every person has different choice for his / her life. Some people may choose to be a globetrotter, while other people prefer to stay in one place. Some people prefer flexible hour work while 9-to-5 is preferable for some people. Etc.